Puertos y Logistica S.A. Group (Pulogsa), which will soon be majority-owned by DP World, has now received a total of seven reach stackers and one empty container handler from Konecranes for its two ports: Puerto Central, in San Antonio, Chile’s main port at the geographical center of the country; and Puerto Lirquén, a little further to the south on the western South American coastline. Four reach stackers, each with a capacity of 45 tons, have gone to Puerto Central, one of the busiest ports in Chile. 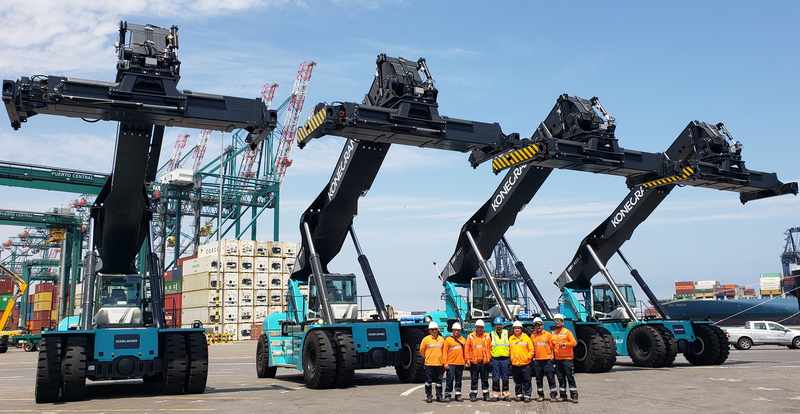 Three more reach stackers – two additional 45-ton models, as well as one with a capacity of 10 tons (for empty container stacking), and one empty container handler – have gone to the smaller port at Puerto Lirquén. The new equipment will be used for loading and unloading shipments arriving at or departing from the two ports, and for placing empty containers in the best position for storage and future transport loading. Every lift truck vehicle in the order is a Smart Connected Lift Truck (SCLT), embedded with intelligent sensors and software. Pulogsa asked for the TRUCONNECT remote monitoring service, which allows certified Verified Gross Mass (VGM) and a SOLAS-compliant dataset to be exchanged directly between the Konecranes lift trucks and any systems Pulogsa has (e.g. TOS, TMS, ERP, etc.) connected to a SOLAS subscription API in Konecranes cloud services. This makes loading container transport like ships more efficient and safer for sea travel. The off-site remote service also provides real-time observation of truck use to make repairs and maintenance easier. In addition, each truck has a reverse camera to help drivers see more completely around them and improve safety in a congested port environment. 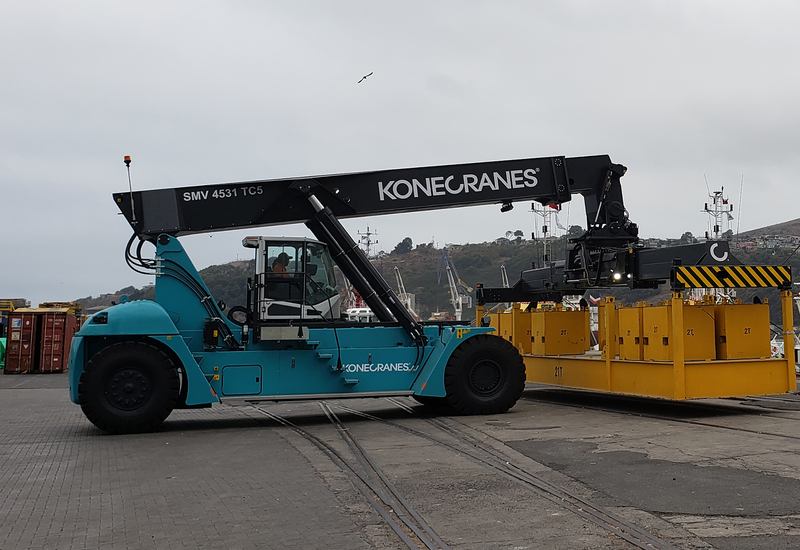 Konecranes received the order in September 2018. All the trucks have already been delivered except the 10-ton reach stacker for Puerto Lirquén, which is scheduled to arrive at the port in March 2019. John Elisson, Regional Director Americas, Konecranes Lift Trucks, agrees. “That, combined with strong local support from Linde, made a winning deal,” he says. He continues: “It’s also important to remember that the technology has made this data fully transferable, something very much appreciated by our Maintenance Management. ABOUT PUERTO CENTRAL S.A. AND PUERTO LIRQUÉN S.A.
Puertos y Logistica S.A. Group (Pulogsa) provides commercial port services in Chile. The company operates Puerto Central, the central Chilean port directly west from Santiago, in the town of San Antonio, and Puerto Lirquén, 500 kilometers (around 300 miles) south by road. Puertos y Logistica was recently acquired by UEA-based DP World.